When planning their perfect wedding, many brides fall in love with the idea of a pretty, rural setting in the country for their special day. It conjures up romantic images of perfect blue skies, rolling green hills, pretty farms, and historic tiny towns. But once they start researching, they are met with the reality of most country wedding venues. Whilst there are many country churches available, most are just basic old buildings that haven’t changed for many years. Peeling paint, old ceiling fans, hard church pews & functional lighting is what most country church venues offer. And the church grounds are often basic with some old shrubs and lawn. Romance is lost to reality. But what if the concept of country church weddings was reinvented? What if someone took all the style and panache of the very, best city wedding and built them within the walls of an historic church in a small country town? Imagine all of the things that fairytales are made of, and you’ll arrive at the new ‘White Chapel Kalbar’. On August 1st, 2017, White Chapel Kalbar opened as a new breed of country wedding venues in Australia. 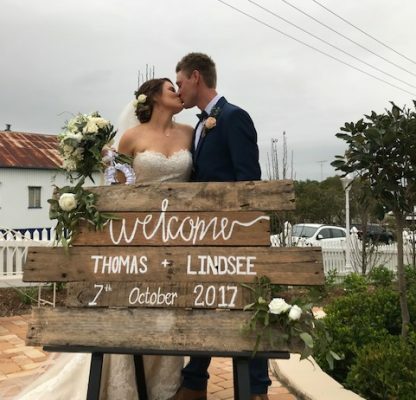 The owners purchased an historic church in the small South-East Queensland town, Kalbar and have transformed it into a stunning, country wedding venue. Located just an hour from Brisbane, the tiny Methodist church, was originally built in 1883 in the nearby town of Boonah and was relocated to current location in Kalbar in 1908. After much love and pain-staking renovation, the 134 year old deconsecrated church now gleams white and has almost a magical, whimsical presence. Every inch of the interior and exterior oozes romance. From the simplistic, American country chandeliers to the amazing soft glowing altar that creates a perfect wedding backdrop. And for an extra sprinkling of magic, a stunning white horse drawn carriage can be organised to bring the bride-to-be to the front of the imposing chapel doors! It’s a new chapter in the old book of country romance. a luxurious groom’s retreat that’s complete with wingback chairs and antique French provincial sideboard. There the groom and his best man can enjoy a ‘nerve settling’ tipple of a single malt whiskey from the beautiful whisky decanter set. Unlike many original country venues, this chapel is fully airconditioned for those blistering Queensland summer days. It also boasts a brand-new country chic wheelchair friendly bathroom with a beautiful French, provincial ‘louis’ change table and even wifi for the guests. Now, no tin shed would have all that. And when the ceremony is over, that’s when the real magic happens. The bridal couple and their guests can spill into the beautifully landscaped, church gardens. A winding path will take them beneath the old church trees and lead them to a tiered stone fountain and breathtaking two-metre high, fairytale book – the ultimate backdrop for any magical wedding. But where to for the wedding reception? Forget haybales and wobbly tables. Nestled in behind White Chapel, is Black Hall. At the turn of the century this once timber Sunday School hall, has now been transformed into an elegant function venue. With new life, comes a whole new look. The old building now wears a contemporary black and white suit of paint and features imposing front barn doors. Gone are the old tables, chairs and stark interior. Guests will now be welcomed by a much, more moody interior, complete with stone fireplace, plush wingback chairs, cow hide rug and a dramatic antler chandelier. It evokes a feeling of style and understated elegance with white vaulted ceilings and dark wainscoting panelling. This colour scheme is offset by the original timber floorboards lovingly restored and polished. And at this country venue, there’s no tin ‘outhouse’. Black Hall’s newly created bathrooms feature ‘charred ‘timber wall, black & white mosaic floors and an imposing backlight mirror. A visit there is a ‘must’, even if it’s just for a look. Black Hall comes complete with hand-made timber tongue and groove country trestle tables and timber cross-back chairs. It also features air conditioning, a state of the art P.A system, free Wifi and a 65” 4K LED TV. Both venues can accommodate up to 80 guests. And at this ‘country’ venue, there are so many options. Canapes could be served in the covered pergola area, while the bridal couple are off getting their photos taken. It sits between the chapel and hall and features a wood-burning outdoor fireplace, fairylight curtain and black iron chandeliers. Imagine mingling with guests around a roaring log fire before dinner celebrations? A more ‘rustic’ option is also available at the ‘The Barn’ bar. This country style bush timber barn is home to the recycled church timber windows and doors and offers an amazing, textural ‘door wall’ backdrop for all of those memorable celebration pics. It features a hand-crafted timber bar with beautiful pressed-metal inserts, a roll top bath for drinks and ice and an antique wood burning stove. Guests can also hire fire-pits for those cold winter nights. Everything at this beautiful destination has been thought of. Should a larger wedding need to be accommodated for, then the lawn area called ‘The Grounds’ can house a marquee for up to 100 guests. Or, if the dream is to be married outside in front of a magnificent mountain backdrop, then a French style Arbour and chairs can be set up. Just like no two couples are the same. No two weddings should be the same either. Unlike many other venues that provide in-house catering and fixed wedding services, this venue enables couples to customise their wedding. They can choose a mix of venues and extras to create their own fairytale wedding. Once in a while life gives us a fairytale and the reality is, it can be found a tiny country town not too far,far away. The whimsical ‘White Chapel Kalbar’ may have just re-written the ways of elegant, country weddings.